I am feeling very refreshed after a great break on the Gold Coast with my dear sister and her family. It is not too cold back here in England but there is a bit to do on the garden which I was happy to start today. I did not get much in Australia but Thomas and I did order lots of boots for staff here, we all seem to love Blundstone boots and Great Dixter and they are a much better price in their homeland Australia. My friend Tony did also bring me a pair from New Zealand which I wore out in the garden today. You have to get something out of life to enjoy it and I was reminded of this while staying with family in Australia. Not only did I learn a lot from gardening in such a climate but I got a lot of joy from seeing my little nephew Kosta going out each morning to see how the vegetable plants are doing. Kosta really does seem to have a natural interest in the production of vegetable. I just hope that he keeps it up and goes out to water them at the end of the day, they are still going to need it and I am on my way home to start seed sowing myself. I was also very happy to pick up at the airport a new copy of Monocle about Australia, it is time to get a house there. The vegetable garden has now really started to take off with the help of the shade cover, it has been very interesting to see what the difference the shade has made. We are also having to make sure the plants get water everyday. I just worry a little that I have now made more work for my brother-in-law Daimian but I think the end results will be worth it. They can also put a pump in and take water from the ground, all the garden will look better from the water from the sprinkler. They have the heat for growth over here but now water is needed. Behind my sister’s house there is a good-sized park and in that park there is a community vegetable garden. It was great to take my sisters children to look at the garden on the weekend to see just what they could grow. It is a very well designed garden and the plants do look great, the children loved to see what was in the garden. I was just sorry that we did not see anyone working in the garden to talk with. It is not going to be long till their garden is looking great. We do try and have a different salad each day so we can all get ideas of salads we can make ourselves. Of course this sort of thing is not very easy to do and I think today’s salad would be very hard to make again. It was a beetroot based salad that had pomegranate, cranberries and sultans on a base of badly spinach. 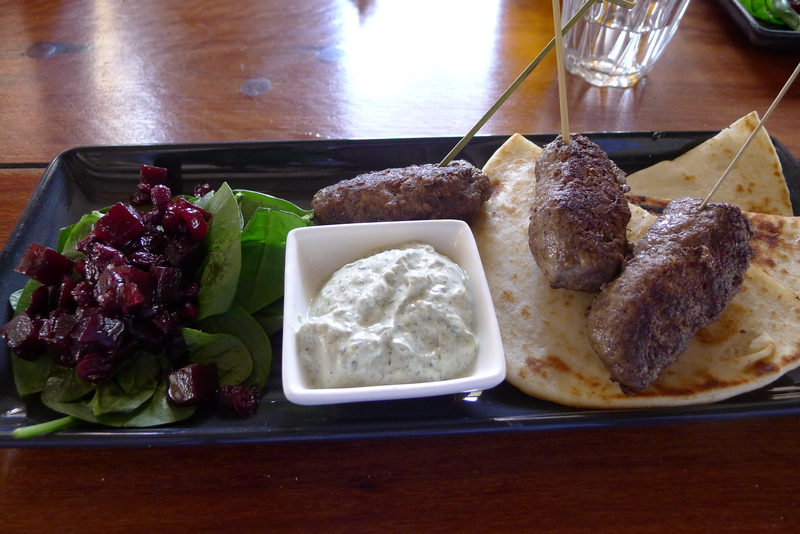 It was great with the minced lamb balls which came with a flat bread and spiced yoghurt. I have found it very interesting to be a small part of this vegetable garden over here. It is a climate that I have not worked in and did not understand just how strong the sun is and the effect this has on the garden. We have had to cover the young plants just so they can get going without the sun on them, I am sure with the heat and water they will really start to get going now. The plants should not need a cover on for too long. The children have mastered the art of watering. The best thing I can teach the children about growing vegetables is how to water them. This is an area that people do get very wrong and then do not understand why the plants do not produce anything. The same thing happened to me a few years ago in the fruit cage, I under watered the plants and the fruit did not develop well. It does seem to be a job that people feel bad about spending time on and so rush it, I have seen it many times. Spending the time watering also gives you a good chance to have a look how your plants are doing.